Have you ever thought of your nails having its own anatomy? Well, for sure it does, it's just too small of a body part to even think about it. An excerpt from naildoctors.com is found below that explains the specific function of each structure. 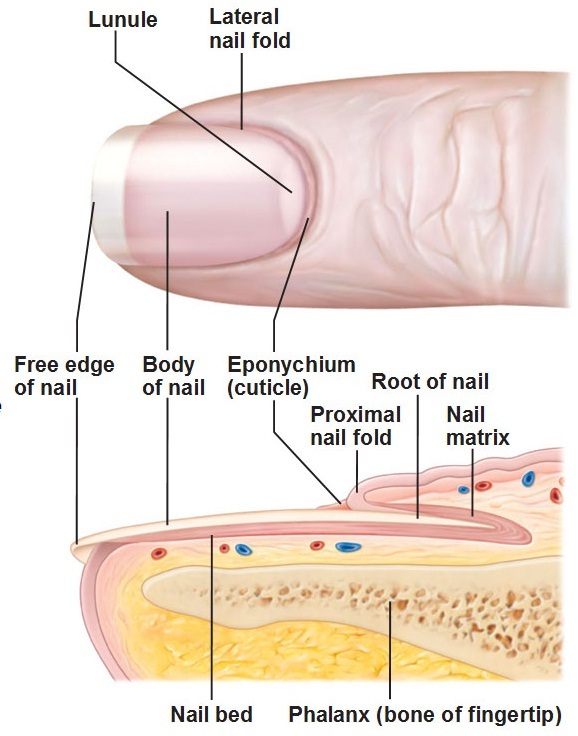 "The structure we know of as the nail is divided into six specific parts - the root, nail bed, nail plate, eponychium (cuticle), perionychium, and hyponychium. Each of these structures has a specific function, and if disrupted can result in an abnormal appearing fingernail. Nail plate - The nail plate is the actual fingernail, made of translucent keratin. The pink appearance of the nail comes from the blood vessels underneath the nail. The underneath surface of the nail plate has grooves along the length of the nail that help anchor it to the nail bed. Nail folds - This is the skin that frames each of your nails on three sides.Nail bed Your nail bed is the skin beneath the nail plate. Cuticle - The cuticle of the fingernail is also called the eponychium. The cuticle is situated between the skin of the finger and the nail plate fusing these structures together and providing a waterproof barrier. Your cuticle tissue overlaps your nail plate at the base of your nail. Lunula - The lunula is the whitish, half-moon shape at the base of your nail. Perionychium - The perioncyhium is the skin that overlies the nail plate on its sides. It is also known as the paronychial edge. The perionychium is the site of hangnails, ingrown nails, and an infection of the skin called paronychia. Hyponychium - The hyponychium is the area between the nail plate and the fingertip. It is the junction between the free edge of the nail and the skin of the fingertip, also providing a waterproof barrier."